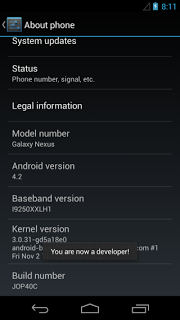 How To Enable USB Debugging in Android 4.2 Jelly Bean ? If you can't find Developer optionsor USB debugging on Android 4.2, don't worry it is not your firmware issue. In Android 4.2 Jelly bean update Google has hided Developer options menu , by default it is not visible in the Settings menu. Go to Settings-> About phone. Now tap on the Build number option repeatedly about 7 times. Now you will get a Toast message you are now a developer. Now go back to Settings you will see the Developer options placed in the menu and you can enable USB debugging.